The project Monoclonal antibodies against the MPER sequence of HIV envelope subunit gp41. 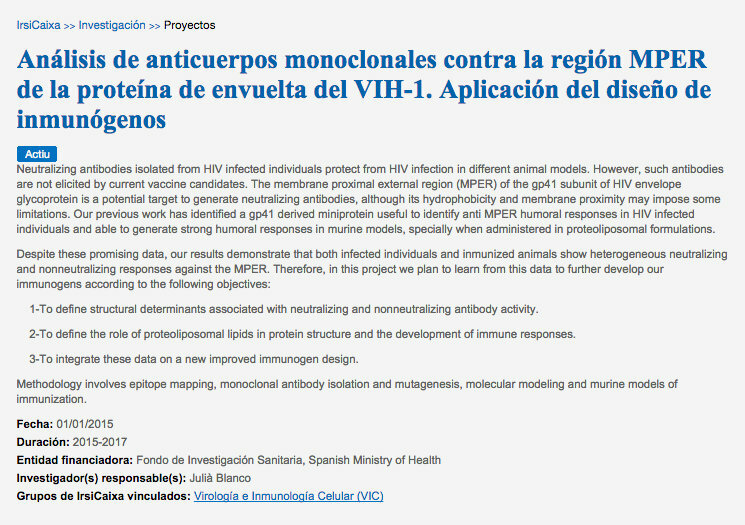 Learning from activity data to desing new immunogens of the Cell Virology and Immunology Group (IRSI-Caixa) has been granted by the Fondo de Investigación Sanitaria, Spanish Ministry of Health (Spain). Our computational group at UVic participates as partner in this project. This entry was posted in CBBL and tagged gp41, HIV, HIV envelope, vaccine candidate, virology. Bookmark the permalink.